The Samsung Galaxy Core comes in a tiny box, which like recent Samsung devices is made from recycled materieals. In the box itself, aside from the usual leaflets, you get a headset with a microphone and volume controls, a standalone A/C adapter and a microUSB cable. The Samsung Galaxy Core measures 129.3 x 67.6 x 9 mm and weighs 124 g. It's not the most space-efficient design and Samsung could've crammed a little more than 4.3 inches by reducing the bezels, but the phone still feels pretty comfortable to hold. The Samsung Galaxy Core follows the same design language Samsung has been using since the Galaxy S III come around. The phone has rounded edges and there's an aluminum-acting plastic rim going around its sides. The front is covered in glass, while the plastic back is removable, allowing you to replace the battery if needed and enabling memory expansion without extra flaps on the rims. Samsung once again has opted for glossy plastics and they're pretty easily smudged and before while it will be close to impossible to clean the Galaxy Core. However we can see the appeal of using lower cost materials as they're both cheaper to produce and later on cheaper to replace should you scuff the device. Samsung is pretty consistent when it comes to designing its phones and although they don't scream high-end most of the time there's no denying they're built well and with ease of use in mind. All the buttons are placed where you'd want them to be and you get the unobtrusive three button layout without losing screen estate. So while the design is certainly pretty tired by know and in desperate need of a refresh, we wouldn't take any points away from the Galaxy Core here - it's practicality that matters more in value-for-money handsets like this one. The Samsung Galaxy Core control layout is business as usual, the smartphone sharing its button configuration with vitually all recent Samsung smartphones. The front is reserved for the 4.3" TFT display of WVGA (480 x 800) resolution. Under it lie the two capacitive back and menu keys as well as the physical home button. Above the display we find the earpiece, next to it the proximity sensor and the front-facing VGA camera. There's no ambient light sensor here. The bezels around the screen are rather wide, which is especially evident on the white unit we have here in the office. The left side holds the volume rocker, while the power button, used for locking and unlocking the device, rests comfortably under your thumb on the right side. Alone on the top sits the 3.5 mm headphone jack. The bottom is where the lone microphone and the microUSB port are located. Moving over to the back of the phone we get a glance of the 5 MP camera lens, which is slightly protruding but the glass is embedded under a chrome accent rim so it's not too easy to scratch. On the right side of the camera lens sits the single LED flash, while the loudspeaker grille is located on the left. There's a Samsung logo fixed in the center of the back panel. In order to remove the panel there's a tiny slit on the right side where you insert your nail and push out. Once the cover is removed you get to see the microSD card slot which is placed above the primary SIM port, the secondary SIM port, which is hot-swappable and the 1800 mAh battery. Samsung claims 500 hours of 2G stand-by and 300 hours in 3G. 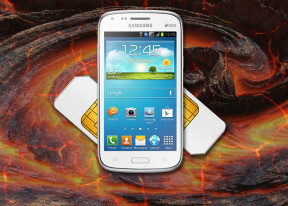 The Samsung Galaxy Core we have on premises is the Duos variety, which sports dual stand-by. While that may lead you into thinking the battery endurance may falter you will be surprised. 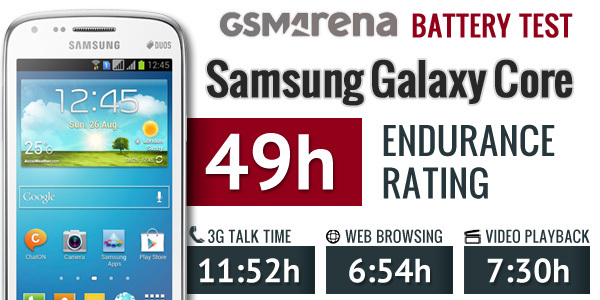 The Samsung Galaxy Core managed an endurance rating of 49 hours. That's the your expected interval between charges if conform to an hour of calling, web browsing and video playback a day. The Samsung Galaxy Core got almost 12 hours of talk time, almost 7 hours of web browsing and 7 and a half of video playback but most impressive was its stand-by time, which isn't much worse than many single-SIM smartphones we've tested. Check out more on the battery including a comparison of the Galaxy Core against the entire fleet of tested phones here.